Enjoy: Join us for a fun and informative event that’s all about helping you live your best life. 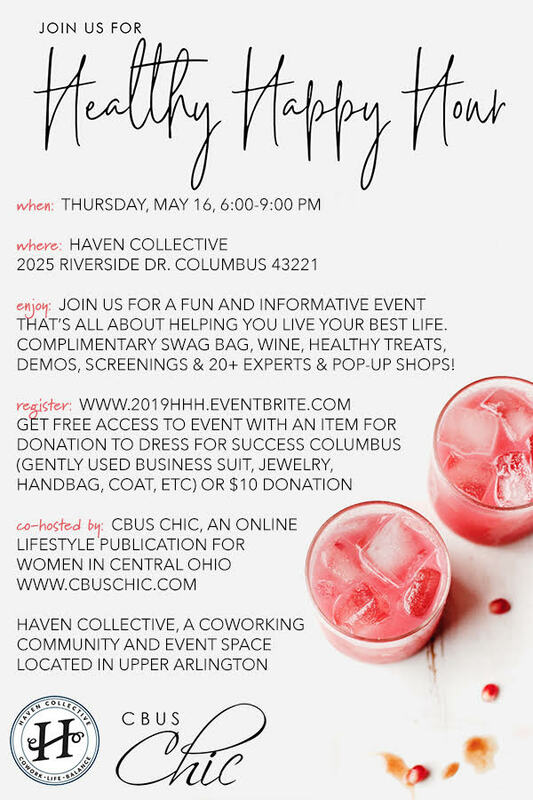 Complimentary swag bag, wine, healthy treats, demos, screenings and 20+ experts and pop-up shops! Register: Learn more & RSVP at 2019HHH.eventbrite.com. Get free access to event with an item for donation to Dress for Success Columbus (gently used business suit, jewelry, handbag, coat, etc – click here to see most wanted items) or $10 donation. Sponsored by: Rohlia, La Petite Penderie Inc., J. Belle & Co Handcrafts, Acoustic Living Boutique, Advanced Wellness Center, Jennifer’s Custom Designs, HelloFresh, Rodan + Fields with Tiffany Armen, Meals Ready to Eat – Columbus, Thrive Well, Once Upon A Child, Girls on the Run of Central Ohio, Atone Chiropractic, Stretch Zone, and more!